Jebel Toubkal is North Africa’s highest mountain. It has been a target for mountain climbers since the 1920’s when the Club Alpin Francis founded a branch in Casablanca and European adventurers started discovering High Atlas Mountains. The path leading from Imlil directly to Jebel Toubkal is a perfect choice for those who want to get straight on top. This two-day trek with an overnight stay in a mountain refuge and an early morning set off for the peak provides marvelous moments observing the silent beauty of the rocks lit up with the sun’s first rays. You will be picked up from your hotel in Marrakech around 8:00 am. Our driver will take you to Imlil (1740m), a Berber village located about 65 km south from Marrakech, where our trek will start. Here we will meet the Berber muleteer crew. 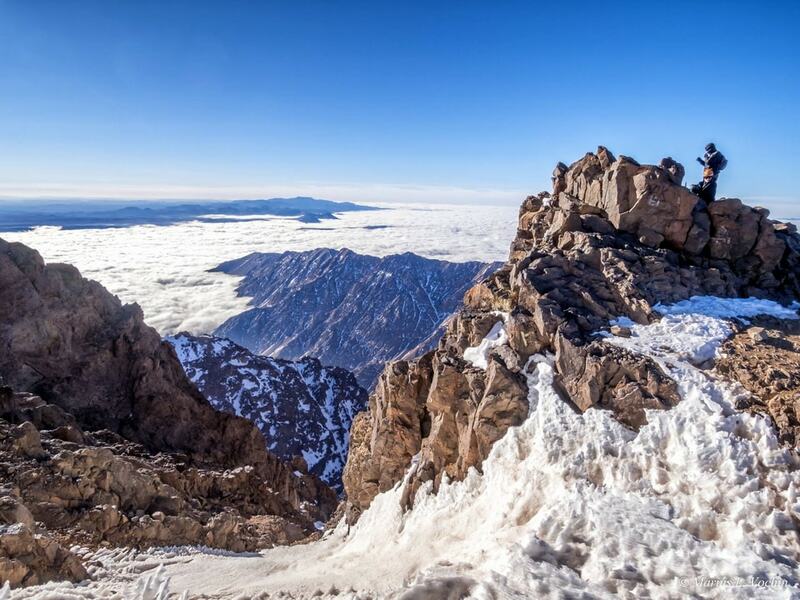 An experienced mountain guide will take you on a walk through the Berber villages via the shrine of Sidi Chamharouch (2500m) to reach the mountain hut. Here we will stop for a picnic lunch. After enjoying the lunch and having a short break, we will continue towards the refuge (3200 m). A glass of tasty mint tea will be served for you there. Hot shower will be available to wash off the dust from your body and freshen up for the next day. In the evening a traditional Moroccan meal will be prepared for dinner. During summer months there is an option to spend a night in the tent. The next day starts with an early wake up to escape from the full power of the Sun. Breakfast is served around 5:00 am. We will begin the ascent climb at 5:30 am. In the middle of our climb we will stop for a short break with some refreshments – water, oranges and nuts. After walking uphill for some 3-4 hours, we will be able to enjoy a picturesque view of all the High Atlas Mountains, valleys and Berber villages. When reaching the summit, we will have a break of 45 minutes to take pictures and enjoy the magnificent view. Afterwards we will return back to the hut, where the lunch will be awaiting for us. To get back to Imlil we will follow the same route down the hill.